Dr. Leonora Fihman attended undergraduate school at the University of California at Davis where she completed her Bachelor of Science degree in psychobiology. She volunteered at the UC Davis Medical Center where she learned about various medical specialties. It was there that she was exposed to podiatric medicine and decided to make it a career. She went on to graduate and received her medical degree (DPM) from the New York College of Podiatric Medicine. Her postgraduate training was completed at Kindred Rancho Hospital in Rancho Cucamonga and at Camp Pendleton Marine Corps Base. She received extensive 3 year training in both podiatric medicine and surgery. During her final year of residency, Dr. Fihman held the position of chief surgical resident. 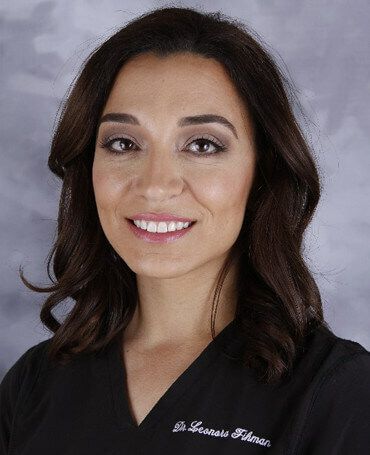 Following residency, she underwent additional training in aesthetic foot surgery with Dr. Vladimir Zeetser and after working together, she was asked to join the practice. Dr. Fihman is extensively trained in all aspects of the foot and ankle with a focus on adult and pediatric flatfoot reconstruction, trauma, sports medicine, deformities and wound care. She likes to complete all her surgeries with an aesthetic twist. She is currently on staff at Valley Presbyterian Hospital and various surgical centers in the San Fernando Valley. Dr. Fihman is a member of several societies and organizations including the American Podiatric Medical Association and the Los Angeles County Podiatric Medical Society. She is board certified by the American Board of Podiatric Medicine (ABPM). Dr. Fihman maintains ongoing training and education to remain up to date on the newest innovations in technology and the latest trends in podiatric medicine and surgery.